Chef René Bajeux dies at 61. I know that my last column was about a death, and I apologize in advance that this is about a passing, as well. This column is about a man I knew and liked very much who happened to be a talented chef, René Bajeux. Early in my time as a food writer – a food blogger, to be more accurate – I was surprised when I was recognized by a chef or the staff of a restaurant. I started writing for friends and then as an outlet for my interest in food and restaurants, and for the first few years I had no idea who was reading. 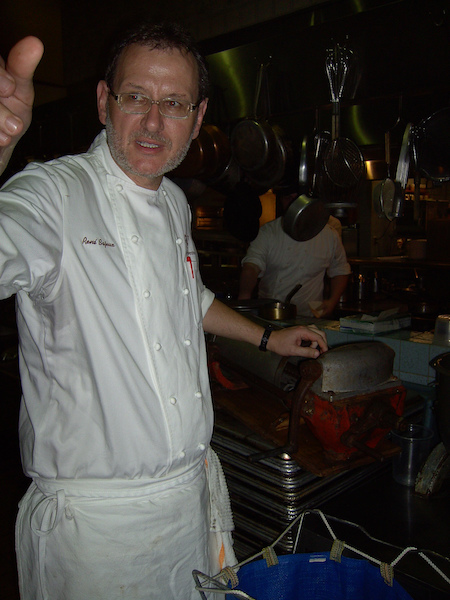 One of the first chefs to come out of the kitchen to speak to me was René Bajeux. It was probably late 2001 or early 2002, and I was having lunch at his eponymous Bistrot when he approached my table and introduced himself. He was complimentary about my writing and actually sat and discussed his cooking with me for 10 minutes or so. I was more or less starstruck. René Bistrot was my favorite restaurant in New Orleans at the time. At least once a week I would take some work there to peruse while I ate lunch. The three-course special he ran was an absolute steal, and it continues to amaze me that as often as I dined there before Katrina forced its closure, I seldom saw the same entrée twice. And while I liked René a great deal, even then, I wouldn’t have returned to the Bistrot if the food wasn’t consistently great. Chef Bajeux continued to come out of the kitchen to speak with me over the years, and I like to think we became friends. I had tremendous respect for him professionally and great affection for him personally. He was one of the chefs I was most interested in finding after Katrina, and when I saw him for the first time, I was both elated to see him safe and a bit taken aback by how much weight he’d lost. His experience during Katrina was not pleasant. He left town for a while but kept coming back. I was always happy to hear that he’d taken a new position in town. I was delighted to renew my love of his three-course lunches when he helped open La Cote Brasserie. I attended a media tour of La Provence when he was briefly the executive chef there, and I got to spend a good bit of time with him when he took over the charcuterie program at the Palace Café. I called chef Gunter Preuss, one of the outstanding chefs with whom chef Bajeux worked for the Dickie Brennan restaurant group. He’d kept in touch with René, and he summed it up well: “It’s a real tragedy … I lost a friend.” He praised chef Bajeux’s knowledge, and of course mentioned his family. I also spoke with chef Chuck Subra, who worked with René at La Cote Brasserie, and he confirmed what I suppose I already knew: Chef René was kind and inspiring to everyone he worked with, from the servers to the cooks to the managers of the hotels that housed his restaurant. René was 61, and that’s far too young to have left us. He also leaves his wife, Penny, and two children. (As I write, I am not aware of any fund set up to assist his family, but if I learn of something, I’ll let you know.) René once told me he loved to teach, and I have no doubt there are a lot of cooks in New Orleans and elsewhere who are better having worked with him. Talking with chefs Subra and Preuss made it clear that René hadn’t graced me with so much attention because I was special — he made everyone feel that way. I can’t think of a better thing to say about another human being. I will miss him.